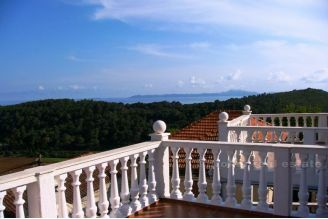 Luxury villa for sale, located near the sea on the western part of the island of Korcula. 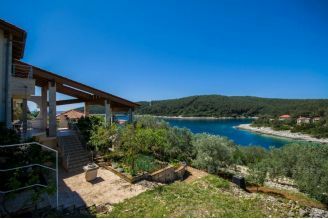 The villa is situated in a quiet cove, about 10 kilometers from Vela Luka and 40 kilometers from the town of Korcula. The house is fully furnished and equipped, using a modern and traditional blend. There is a sea view from the each floor of the Real Estate. The property is located on a plot of 400 m2, covers a total of 220 m2 of living space and consists of two floors. The garden is well maintained, with a sunbathing area, a dining area, a pool (25 m2), an outdoor shower and a fireplace. In the overhang is located a two-bedroom apartment, with two balconies and access to the terrace with swimming pool. On the first floor there is a comfortable penthouse consisting of two bedrooms, two bathrooms and three balconies. Both apartments are air-conditioned.